as for warehouse keeper, whom he assists and for whom he deputises; supervises warehouse foreman and warehouse labourers (942); responsible for periodic inspection, of goods warehoused to ensure that they are not damaged by damp, overheating or rats; supervises delivery of goods in absence of foreman. assists warehouseman q.v. and takes his place in his absence; does less skilled or routine work in keeping records, issuing stores, supervising packers, etc. ; may have charge under warehouseman of a section of warehouse. has charge of cold air stores; controls and supervises staff, and is responsible for proper storage of goods and their receipt and despatch. is in charge of packing and despatch room, and is responsible for making up and packing of mixed order for chemicals, etc. ; requisitions bottles, labels, wrapping papers, boxes, barrels, and chemicals from storekeeper (941) q.v. checks and records numbers of articles entering or leaving warehouse. addresses packed goods, and despatches them from warehouse, obtaining and filing carmen's signatures for receipt of goods; keeps books showing consignees, nature of packages, etc., usually keeping separate books for each railway company or cartage contractor; cf. newspaper despatcher (942). supervises packing, loading, and despatch of goods from warehouse furniture depository, or other place of storage; directs and controls workers therein; sometimes also prepares statements of goods loaded, trucks used, etc. ; often further distinguished according to branch of industry, e.g. foreman packer, foreman yarn packer, warehouse foreman, packer foreman, etc. goes round warehouse with Excise officer; sets-up casks, i.e. places them on blocks to render level for capacity test; starts, i.e. knocks out, bungs; replaces hung, with mallet, after tests; when not so employed, assists in loading and unloading casks, packing cases, etc., for receipt or despatch, cf. storeman (distillery) (941). a warehouseman q.v. issuing yarn, etc., in a hosiery factory. a warehouseman q.v. who draws goods from store, makes up, packs and despatches them, in fulfilment of orders received through post or firm's travellers. see foreman ; sometimes specifically designated according to status, e.g. second overlooker, under overlooker. a warehouseman q.v. employed in certain minor textile trades where small wares, etc., are stored in racks. guards safes and strong rooms of safe deposit establishment, shows customers to their safes and takes note of persons entering and leaving strong rooms. is in charge of safe deposit establishment, and responsible for safety of articles deposited; interviews clients, arranges rents. a warehouseman q.v. who keeps stock hook showing amount of stock (as distinguished from stores, which are normally raw or semi-manufactured materials, or tools, for use in manufacture or production), and quantities of goods passing through warehouse or stock room; checks stock hook periodically against stock in hand; cf. stocktaker (789); in some trades (e.g. corset making), also interviews travellers and buys materials. a stock keeper q.v. employed in warehouse wherein is stored raw wool awaiting processes; in particular, knows various grades of -wool stored, keeps stock hooks and maintains stock. takes in work from weavers (370) q.v. , measures it with yard stick, examines cloth and books it in, recording defects against weaver concerned; hands records to wages clerk (939) q.v. a bonded warehouseman q.v. who has charge of vats in which wines or spirits are stored, and superintends addition or withdrawal of liquor. a bonded warehouseman q.v. who has charge of vaults in which wines or spirits are stored, and is responsible for due observance of terms of bond; supervises coopers (477) q.v. 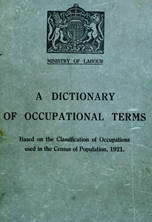 or other workers employed in vaults; in P.L.A. service, reports direct to dock superintendent (731) q.v. has charge of warehouse premises and is responsible for safe custody, locking them up at night, etc. ; keeps necessary records of goods passing in and out; if under P.D.A., furnishes statements to collector of dues (731) q.v. (iii) in supervising work of subordinate workers; often also performs one or more of a great variety of other duties, according to industry or business, e.g. unpacking, preparation, and care of raw, or semi-manufactured materials, and issuing them to other workers; examining finished goods, and rejecting, or sending back for correction, those that are imperfect; keeping account of faults in weaving; waiting upon salesman (775) q.v. , etc. ; sometimes (loosely) used in sense of storekeeper (941) q.v. ; often further distinguished according to nature of duties or class of goods handled, e.g. brown warehouseman (unbleached linen), cake i.e. (oil cake) warehouseman, carrier's warehouseman, cloth warehouseman, corn warehouseman, cotton warehouseman, nickel warehouseman, oil warehouseman, rag warehouseman (rag sorting), rough warehouseman (brass castings, etc.). a warehouseman q.v. in a warehouse where goods subject to Customs or Excise duty are received and stored, "under bond" that duty will be paid when goods are cleared for consumption. a warehouseman q.v. in granary, besides general warehouse duties, supervises discharge of grain from ships by elevators, into warehouse and necessary weighing arrangements before grain is placed in store; ensures that daily inspections are made by grain examiners (942) q.v. ; examines parcels of grain reported as of low quality and reports to owner. is employed in wool sorting warehouse as a wool stock keeper q.v. or otherwise; is responsible for condition of sorted wool and for its distribution and despatch. keeps stock books shewing amounts of sorted and of unsorted wools in wool sorting warehouse.